In the adult selection, there is a large collection of fiction and non-fiction books in the traditional print format, books on tape and CD, videos and DVDs as well as large print books, a wide selection of magazines and a genealogy area. There are several areas inside with comfortable seating as well as a large study room with adult reference materials and homework resources. There is a front porch with benches and an inviting gazebo with a trickling fountain tucked away in the garden. Jam with other amateur musicians playing old-time mountain music. Come to sing, or just come to enjoy music at the library. Weather permitting, the jams are on the front lawn of the library. In December we always include holiday favorites in the mix. Anyone with a banjo, guitar, mandolin, fiddle (anything unplugged) is invited. Larry Barnett of Grandpa's Music (Depot Street) keeps the music flowing and the fun going. Normally, Barnett calls out a tune and its signature, and the group plays it together; but there's also a chance for anyone to share with the group a song they would like to perform. 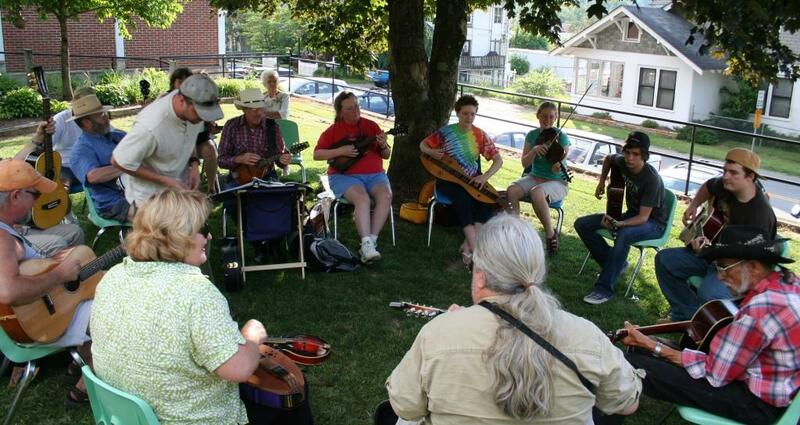 The community jams offer a chance for musicians of all ages and levels of ability to share music they have learned over the years or learn the old-time mountain songs. This program receives support from the North Carolina Arts Council, an agency funded by the State of North Carolina and the National Endowment of the Arts, which believes a great nation deserves great art. In addition to our twice-monthly community jams, come join us for a variety of free music programs, most of which are held on the front lawn of the Library - weather permitting; otherwise they are held in the library auditorium. Snacks and refreshments will be provided by the Friends of the Marianna Black Library. Video montages of some of our concerts are on YouTube.